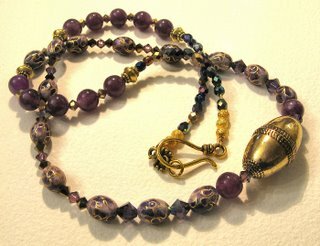 I made this necklace this week, by Sunday or Monday. 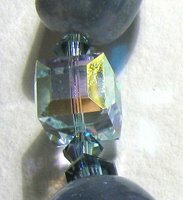 I called it "Tsukimi", which, in Japanese, means "viewing the Moon". 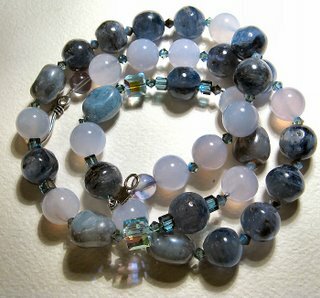 It uses bluish-gray colours and seems a bit different from my previous work, since I use no focal beads or pendants. 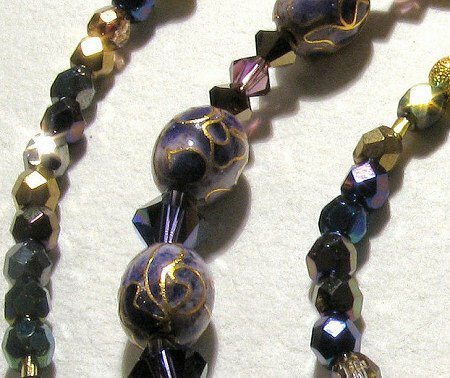 Still symmetrical though, but a continuous line of several Swarovski elements, gemstones and glass beads (that I brought from Prague). It is a "lunar" piece, due to the choice of cool hues that reminded me of the surface of the Moon, thus, its name "Tsukimi". 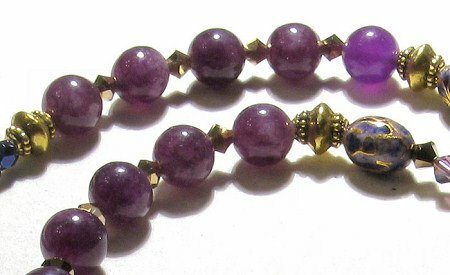 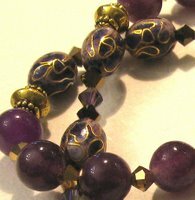 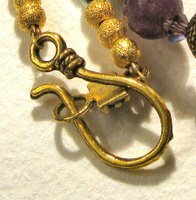 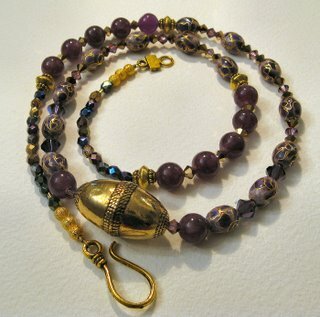 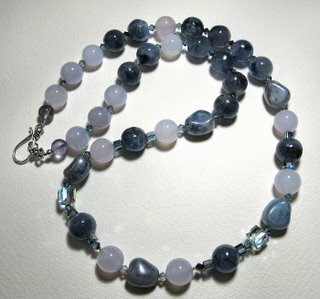 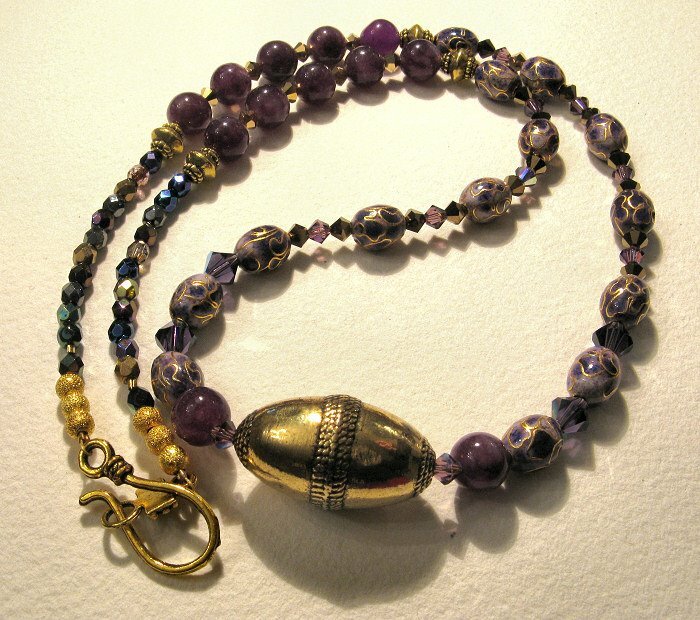 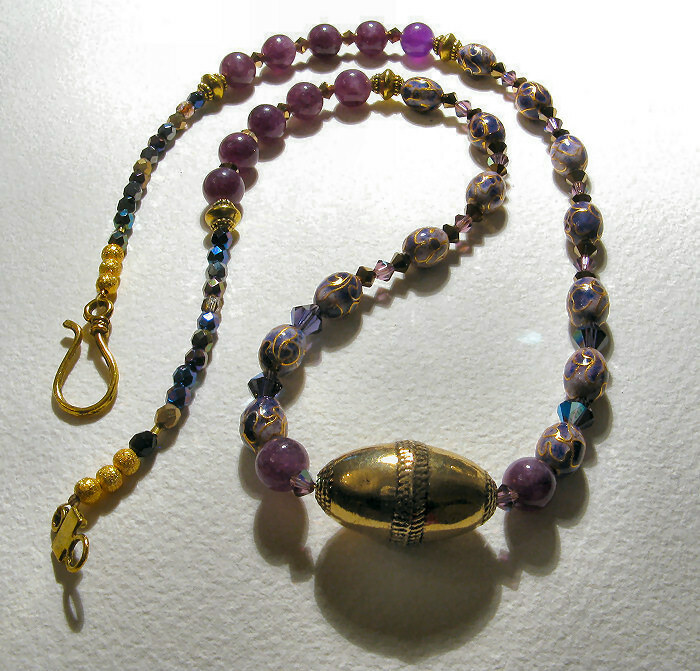 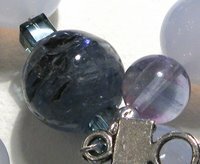 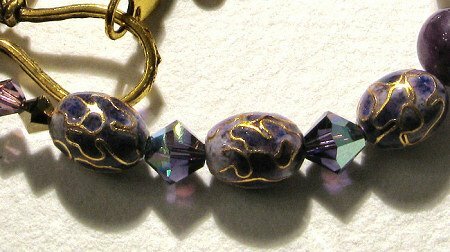 - Two small fluorite beads near the clasp. 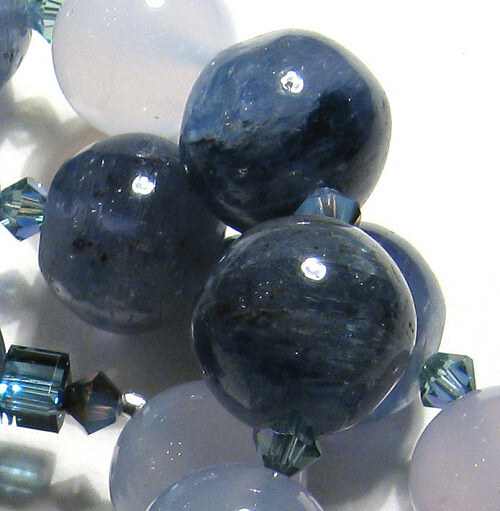 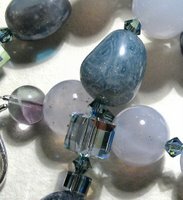 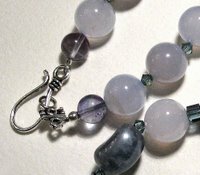 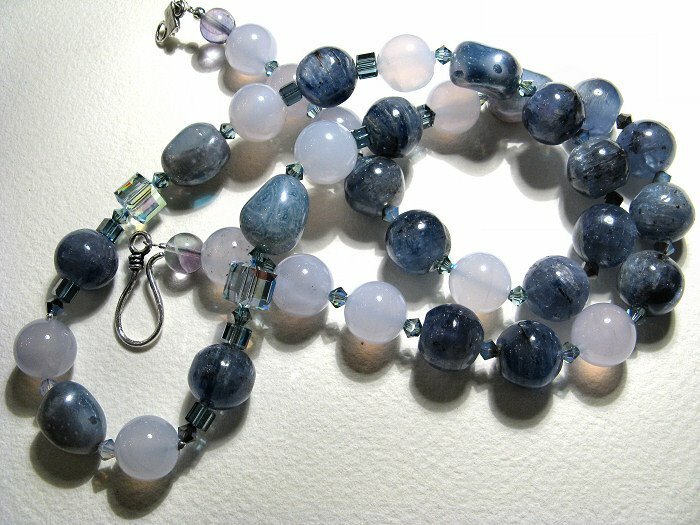 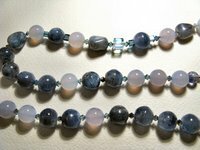 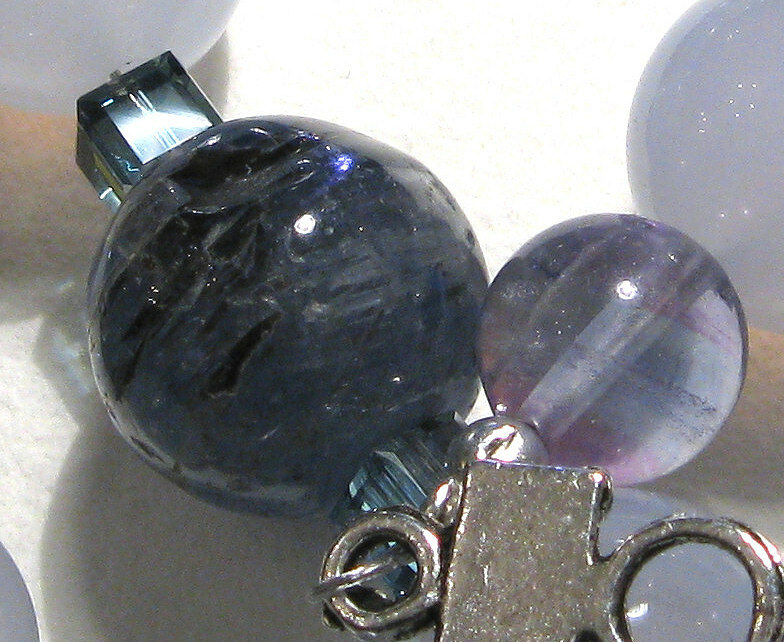 The 1st picture shows a detail of the silver clasp, the two small fluorites I used close to it, the lovely light blue milky chalcedony stones, along with some Swarovski bicones and a Czech glass bead. Second shot shows the Czech beads in detail, as well as two sizes of Swarovski cubes interspersed with some small bicones. Finally, the 3rd picture shows the string of beads: kyanites, chalcedonies, Czech glass beads and Swarovski elements, quite a simple structure. 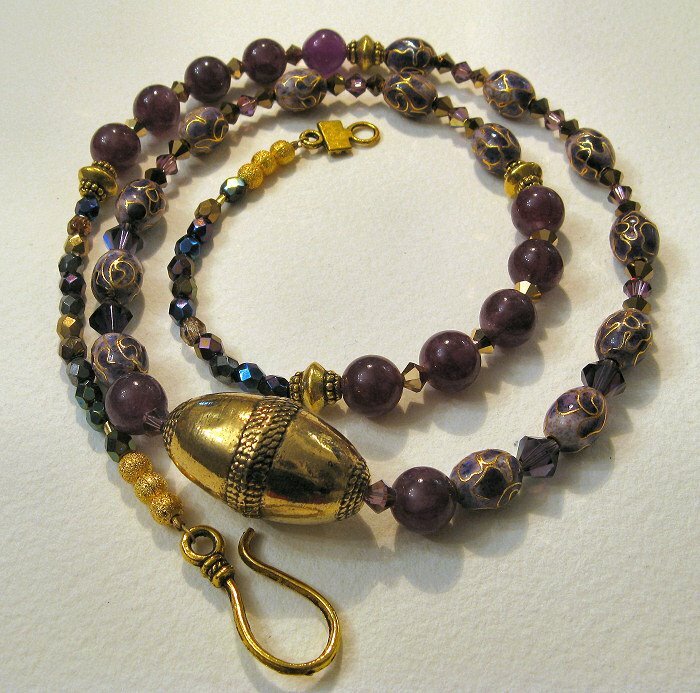 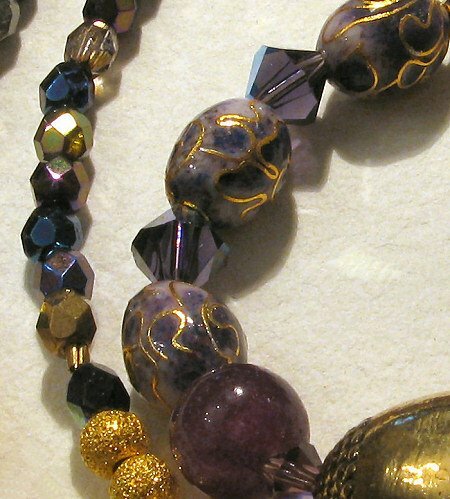 The necklace itself, since it is composed of mostly minerals, is quite heavy and I had to use a sturdier and thicker Beadalon wire, which, due to its gauge, is not quite easy to work with (the beads seem to "slip" though them a bit too easily, and crimping is very hard since the surface is so smooth and slippery). I much prefer the lighter, thinner wires due to their flexibility and slightly rougher texture. 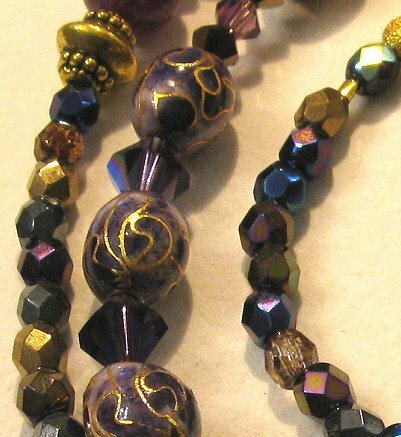 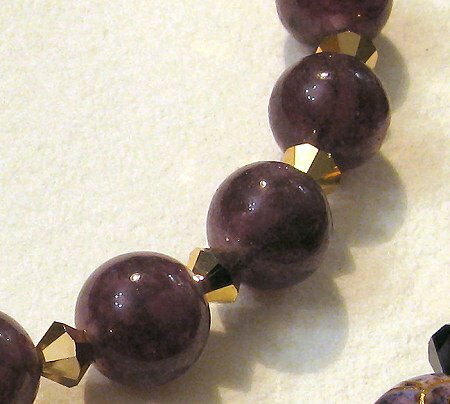 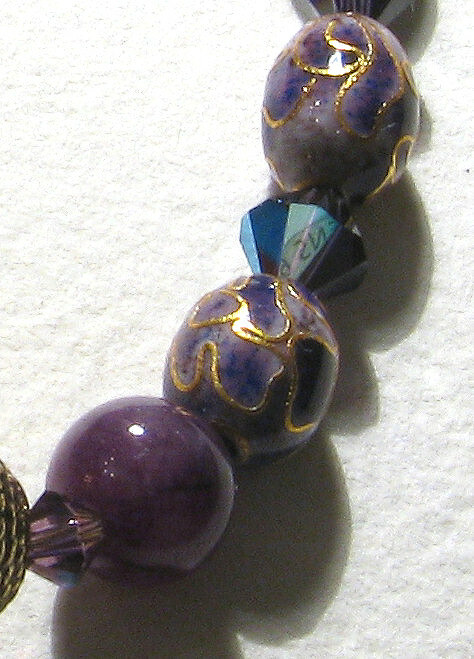 Another detail of the gemstones, Czech beads and lovely Swarovski elements with an AB coating. 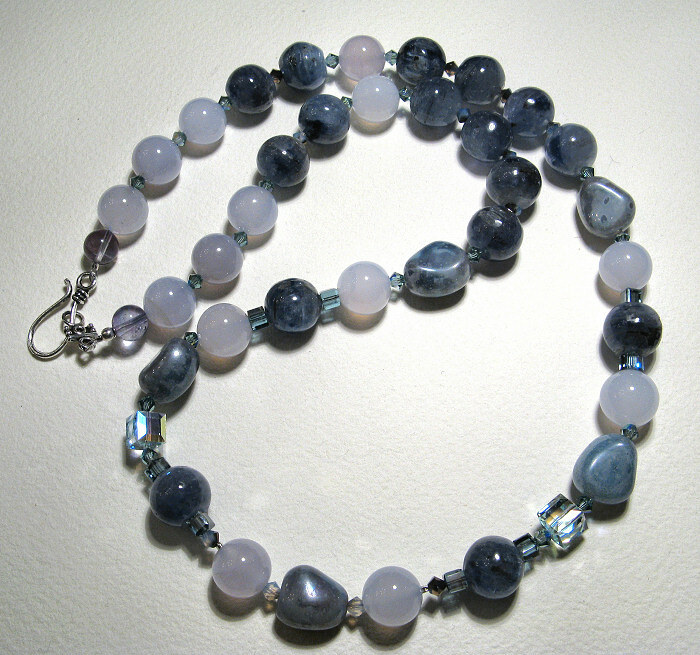 Chalcedony is the stone with the light blue tint and milky texture. 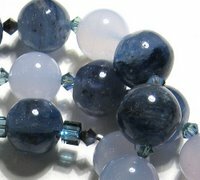 Kyanite is the dark blue one, a sapphire-like shade of blue almost, very vitreous and speckled with silver/metallic streaks. 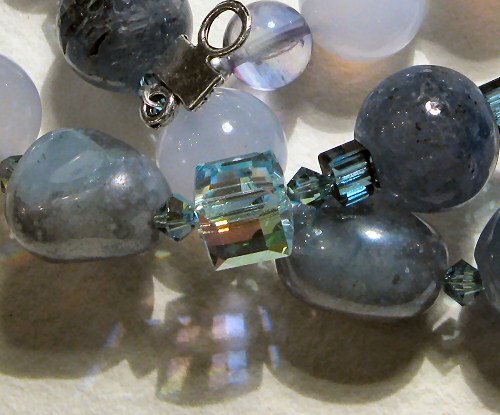 Kyanites and chalcedonies in detail once again, and a nice close-up of one kyanite bead, a small fluorite with its pale green and purple streaks, and one of the small Swarovski cubes. I love the AB effect on the aquamarine coloured cubes (larger ones). 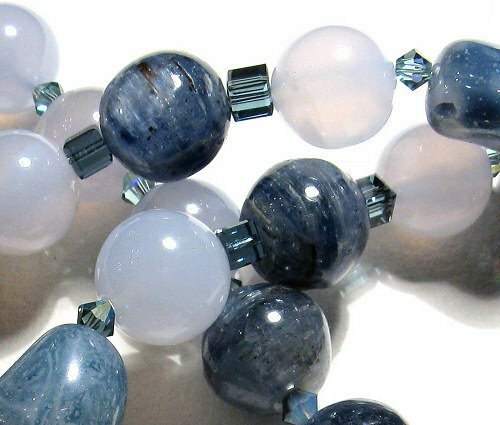 The kyanites are also splendid, but unfortunately I have ran out of them! 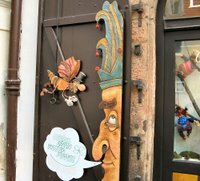 We arrived from Prague last week. 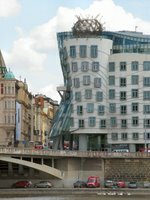 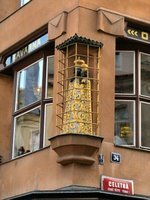 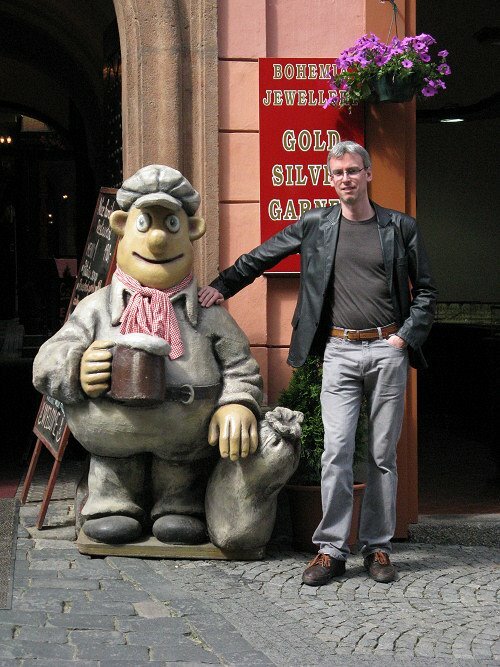 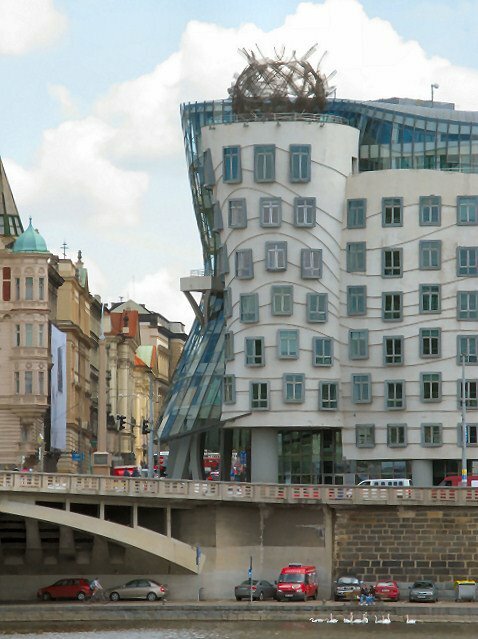 We went there for 5 days, since Mark ran the Prague Marathon for the 1st time. 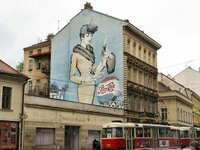 It easily became one of my favourite cities. I love its cleanliness, the way everything works, and how calm the traffic is. 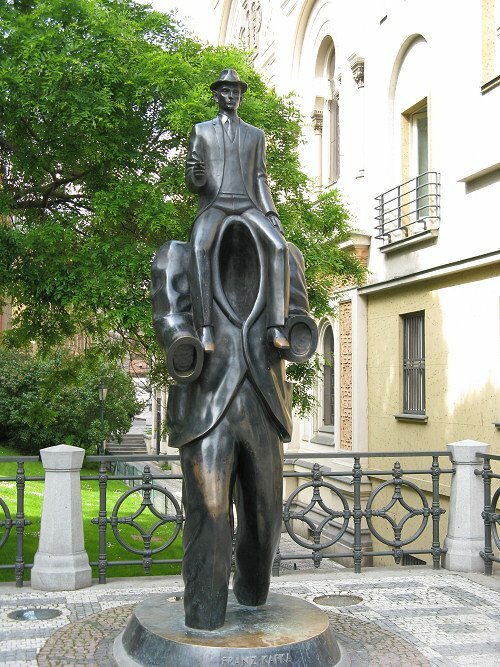 People seem relaxed there. 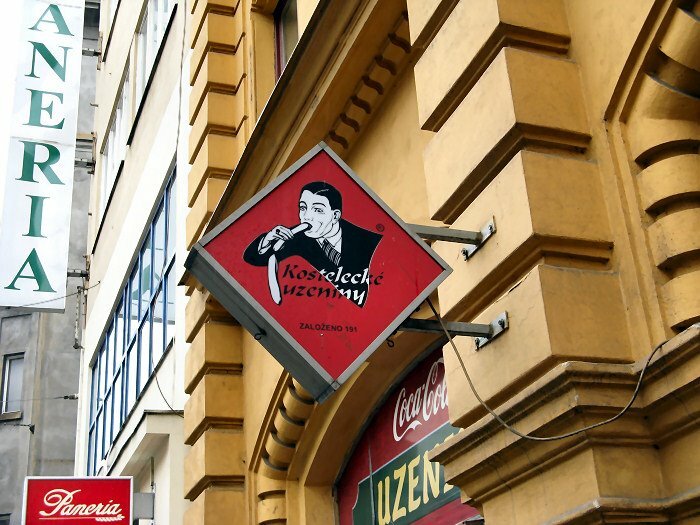 The shops (at least in the old town) stay open until late, and you can get some really nice ice cream and lovely drinks and food. 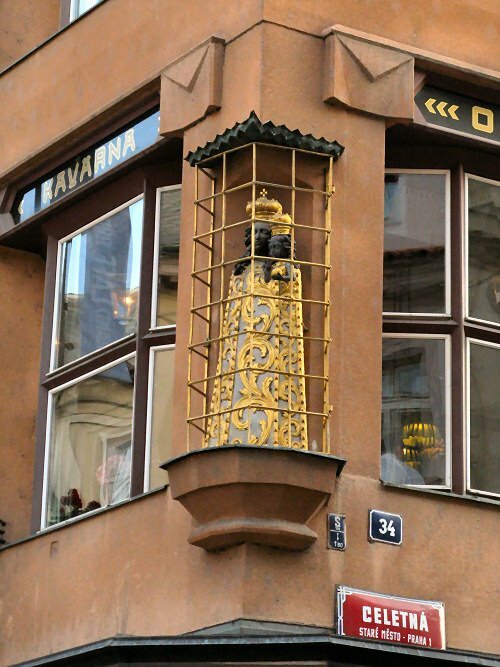 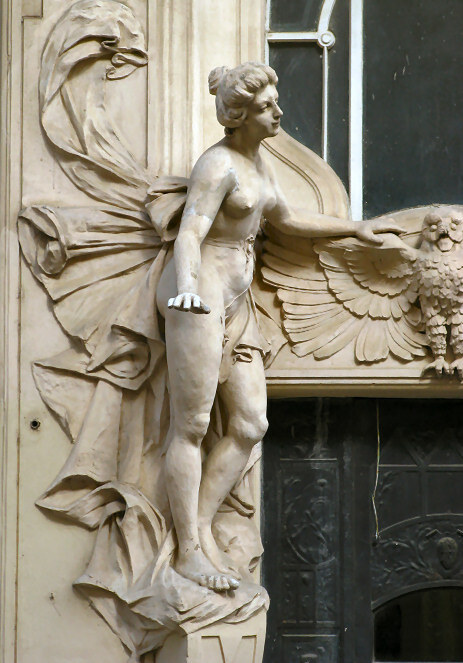 Also, that mix of Baroque, Gothic and Art Nouveau is absolutely enchanting, and very very unique. 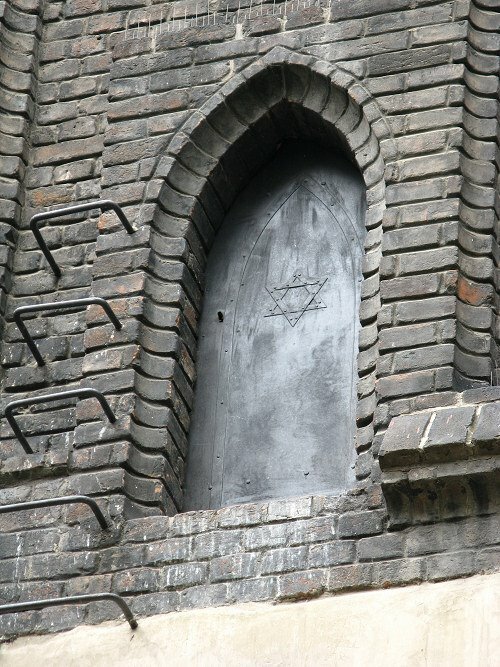 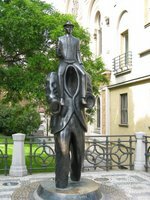 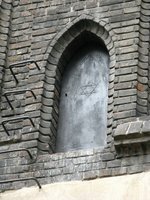 My favourite walks must be the ones we took in the Josefov, the Jewish quarter area. 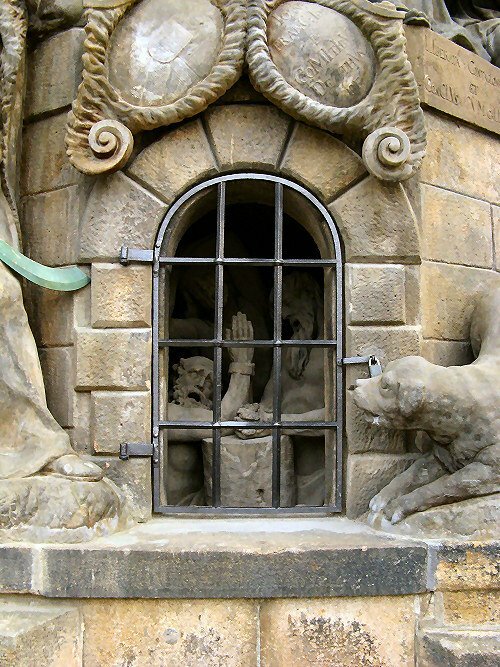 Absolutely magical. But tonight, I just want to post some curious pictures we took in several different places... Please click on the thumbnails to magnify them.